In order to destroy all bacteria, their spores, and the toxins they produce, low-acid foods (meats, poultry, sea foods, and vegetables) must be heated to a temperature of 240° F and be held there for the time specified by the recipe. Following proper canning procedures is critical for successful steam-pressure canning. Lid - Locks or clamps securely onto the base and may be fitted with a gasket, vent pipe and safety valve. Gauge - Dial or weighted, the gauge measures the pressurization of the canner. a. Dial Gauge - must be tested for accuracy prior to each canning season. If the gauge registers high by 1 lb. or more it must be replaced. Should the gauge be inaccurate, all of the bacterial spores that emit toxins may not be destroyed during processing. Your county Cooperative Extension Service or the manufacturer of the canner will be able to tell you where to go to have your gauge tested for accuracy. b. Weighted Gauge – exhausts small amounts of steam during the entire processing period. The movement of the weighted gauge during processing indicates pressure is being maintained at the selected pounds of pressure. The weighted gauge does not require testing for accuracy. A three-piece weighted gauge and some styles of a one-piece weighted gauge have adjustments for 5, 10, and 15 pounds pressure. A one-piece weighted gauge that does not adjust for different pressure levels is designed to process only at 15 pounds pressure. When using a one-piece weighted gauge that processes only at 15 pounds pressure, follow manufacturer’s instructions. Jars –Canning jars come in many different sizes. Choose the size appropriate for the job you are doing. Select only jars that have “Mason” written on them. These jars have been tempered and can with stand the high temperature (240° F) that is need to process low acid food. Lids and Bands –come in a case when you buy new jars or you can buy them separately. You can use your bands over and over again but lids cannot be used for processing more than once. Jar Lifter, jar Funnel, Bubble Remover, and Lid Wand, are not essential utensils but they do make your job a lot easier. When you are canning you are dealing with very hot water and food and these items help keep you safe if used right. 1. Put canner rack inside canner base. Add 2 to 3 inches of water. Heat water to a simmer (180° F). 2. Prepare recipe using a tested recipe from a reliable canning source. 3. Place lids and rings in simmering water. Use enough water to cover them. Allow them to simmer for at least 5 minutes to soften the gasket on the lid. 4. Fill jars with food and add liquid if necessary. 5. Eliminate air bubbles using your bubble remover or plastic knife by pressing the food toward the center of the jar. Rotate the jar and do again. Do this about 3 times. 6. Wipe rim of jar with a damp towel to remove any particles of food, syrup or salt. 7. Place simmered lids and rings on jars and tighten slightly. 8. With a jar lifter, place the prepared jars in the pressure canner. 9. Tighten or seal the canner lid to the base. 10. Set your heat source to high and open your petcock or take your weighted gauge off of the lid of your pressure canner. 11. Your pressure canner needs to vent for 10 minutes. 12. 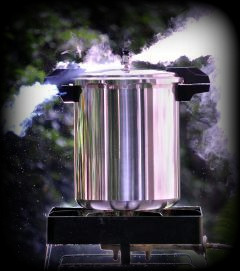 When steam starts to escape the vent or petcock, let the canner vent for 10 minutes. 13. Place your weighted gauge on your lid or close your petcock and wait for the pressure inside the canner to build up to the proper amount of pressure for your altitude. Once it has reached the correct pressure reduce the heat low enough to maintain proper amount of pressure. 14. Set the timer for the amount of time called for in your recipe. 15. When the processing is done. Turn off the heat source and wait 5 minutes before opening the canner. 16. Unlock canner and remove the hot bottle with a jar lifter and place on a protected surface. 17. Allow to cool for 12-24 hours undisturbed. 18. Label and store in a cool dry place. If the jar did not seal, place in the refrigerator and use within 2 to 3 days. If you live above sea level you must adjust the amount of pressure according to your altitude.